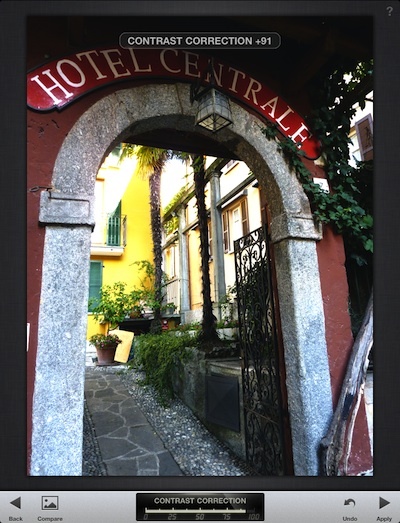 As photo editing on the iPad become more popular, the many options have chosen different ways of how a user performs their edits. Some attempt to replicate their desktop counterparts, others have creative rethink of working quickly with a few swipes and pinches. An app we have been playing with for over a week is Snapseed (only for the iPad). It offers all of the photo editing tools that you expect from a mid level app, so it falls between an app that only adds filters but less than Photoshop on a desktop. Watching someone using it, you will noticed they tap very little, mostly just sweep their fingers across the screen. 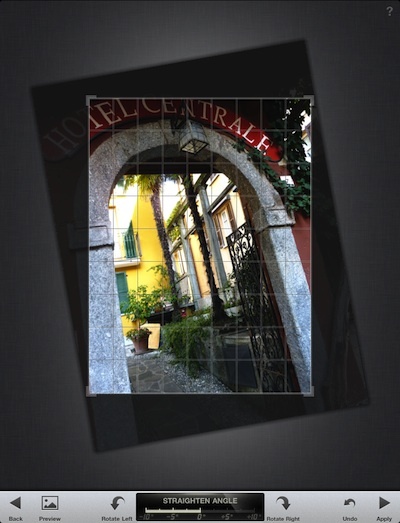 After bringing an image into Snapseed, there area photo tuning options across the bottom of the screen. Sweep left/right through the two screens of the tools. 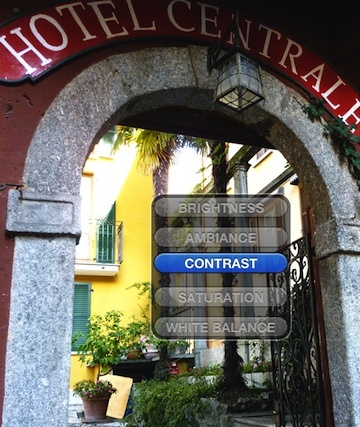 The first, ‘Automatic’ analyzed the image and adjusts image color and exposure. This is an extra step that isn’t needed if you already know what you need to adjust. It is handy though and we see many folks using it first to see if it does what is needed without doing any tuning adjusting. 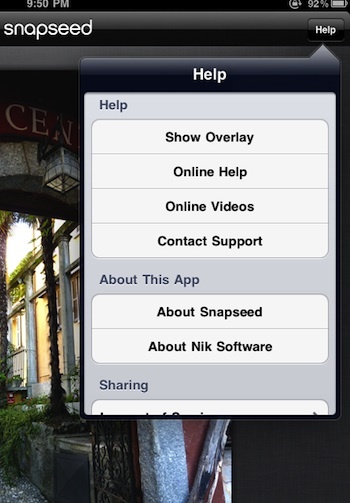 The first time you visit any image tuning tool area, Snapseed shows a ‘help’ screen to explain how to adjust the photo with that tool. When a adjustment group is chosen, just moving your finger left/right across the screen applies the +/- changes. Note the pop up box near the top of the screen that states the adjustment being made and it’s change. This same information is presented at the bottom of the Snapseed screen in a different style. A ‘Compare’ button shows you with/without the change made. When you have the image to the point you want, the ‘Apply’ button must be used to make the adjustment perminate. Moving between the Snapseed photo editing options when on a screen is available through moving a finger up/down on the screen. A list of options with current highlighted, just move to what you want to use next and release. Then move your finger left/right to tune using that tool. 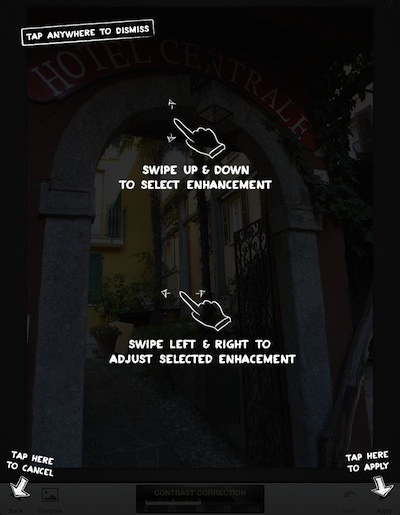 After a couple times using Snapseed, most users are quickly tuning by just moving their finger up/down and left/right without having to constantly moving between taps and swipes. 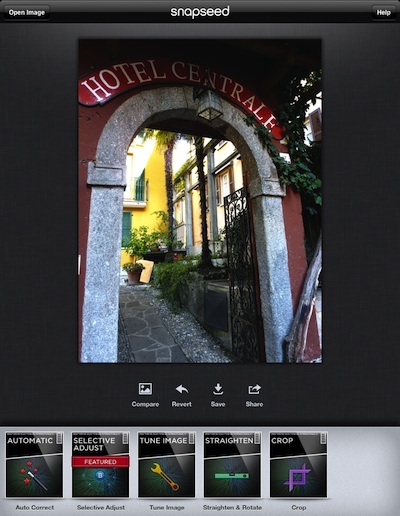 Many iPad photo editing apps offer to rotate an image a quarter turn at a time. Some even offer what seems to be unlimited twisting of images, but generally these are jerky or set to actual limits. Snapseed two finger twisting of images is increadably smooth and really does tiny adjustments. Many of the photo tuning screens have options that act like initial photo filters you can apply before fine tuning. 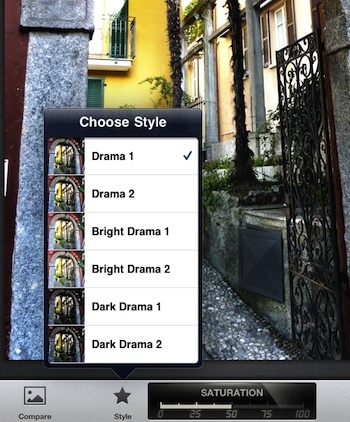 The list of options available for the particular editing screen are accessed by tap and holding on Snapseed’s Style button at the bottom of the screens. Editing of a photo doesn’t have to be for the full image. Snapseed offers the user to pinpoint an area (note the ‘B’ dot) that actions are taken on. If you have an image with a dark corner that has lost some detail, they can be pulled more into view with just a couple taps and sweeps. Near the beginning of this post, we showed a screen shot of how Snapseed tells you what editing is possible with the tool and how to use it. Simple white hand images with actions text. These can be accessed through the ‘Help’ button anytime within the app. 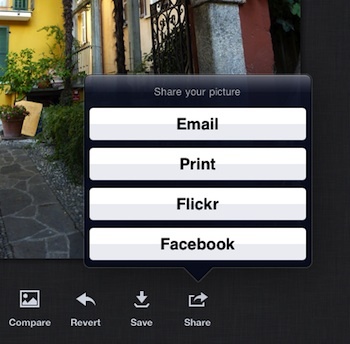 When the editing is complete, the Snapseed app lets you email the photo, save to the iPad photo library, print, or share via Facebook and Flickr.